If you need to remove trip hazards from uneven sidewalks, concrete walkways or handicap ramps, Florida Sidewalk Solutions can help! We are the top sidewalk repair company in Pembroke Pines, Florida. We guarantee to get the job done right! Florida Sidewalk Solutions has a team of sidewalk repair specialists with the experience and skills to remove all tripping hazards from your sidewalks. 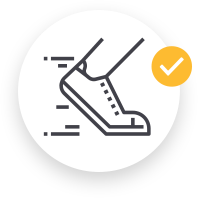 Our services will bring your sidewalk into compliance with the American with Disabilities Act (ADA) and increase safety by removing trip and fall liability. Our team at Florida Sidewalk Solutions has the expertise and equipment to tackle any job regardless of size. No job is too big or small for us to handle. Florida Sidewalk Solutions has eliminated trip hazards on uneven sidewalks from over 10,000 miles of sidewalks. 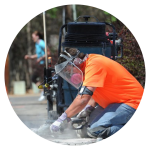 Our Precision Concrete Cutting (PCC) technology is the cleanest, fastest and most efficient solution available. We will get the job done quickly without aggravating or disturbing the neighbors and surrounding area. Florida Sidewalk Solutions is devoted to saving you time and money. Our sidewalk repair specialist can save you 70-90% by eliminating your trip hazard. We go through various phases to get this job completed. Phase 1: Our trip hazard experts will take exact measurements of your trip hazard to know where to start and end the cut. This phase will ensure your sidewalk is ADA compliant. Phase 2: During the second phase of the process our trip hazard experts will ensure a zero point differential between slabs to both sides of the sidewalk. Phase 3: We collect and recycle all remains left behind to keep a “green” solution to trip hazard removal and repair. After these phases are done and completed your sidewalk will officially be ADA compliant, OSHA compliant and trip hazard free. This will be done with minimal disturbance to anyone or anything in the area including landscaping, trees, and sprinklers. With over 13 years of experience in the industry, Florida Sidewalk Solutions provides the highest quality products and service. We are committed to guaranteeing your satisfaction and our methods will save you thousands of dollars. Contact us here for a free estimate with the top Pembroke Pines sidewalk repair specialists. If you need more information or have any questions feel free to call us at 954-514-7218. We are ready to take your phone call and our sidewalk repair specialist will be happy to answer any questions you may have.